Hungry? 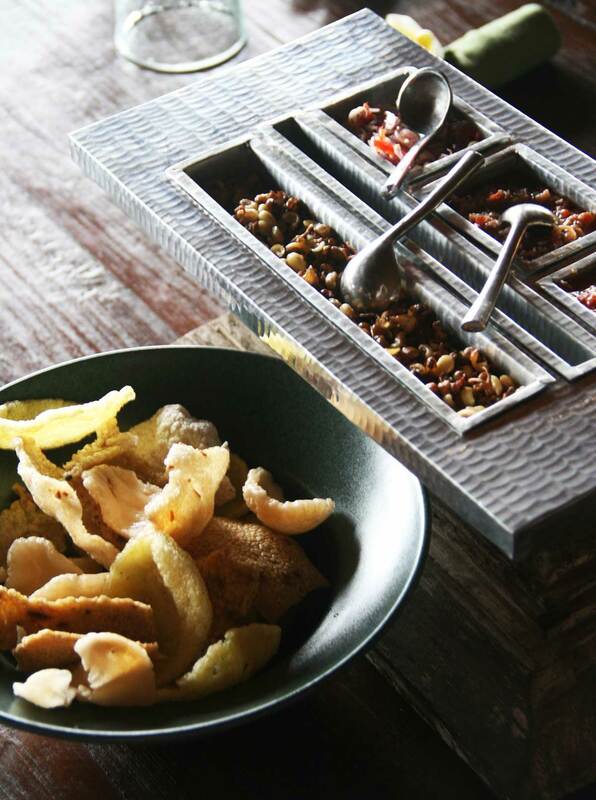 Bali will feed your curious belly. If you have ever dreamed of going to Bali, but hesitated… don’t hesitate. Just make it happen. 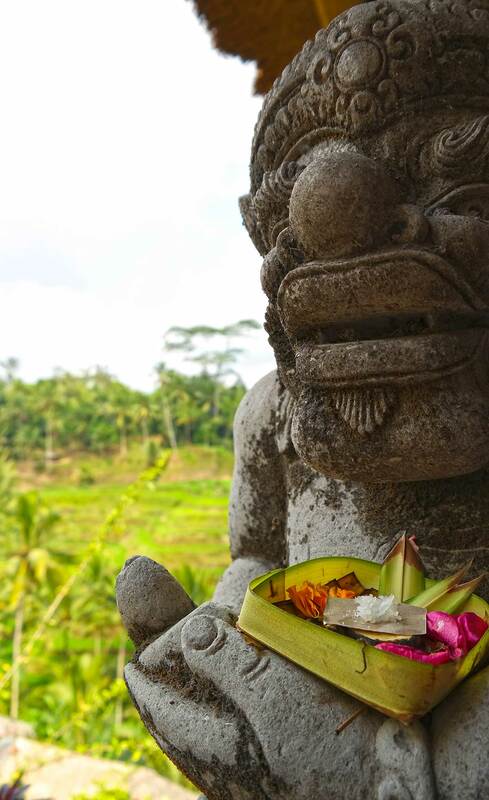 I want to finally share more photos from my trips to Bali, so jump on a virtual tour with me. Let’s start with the most delicious topic: food. 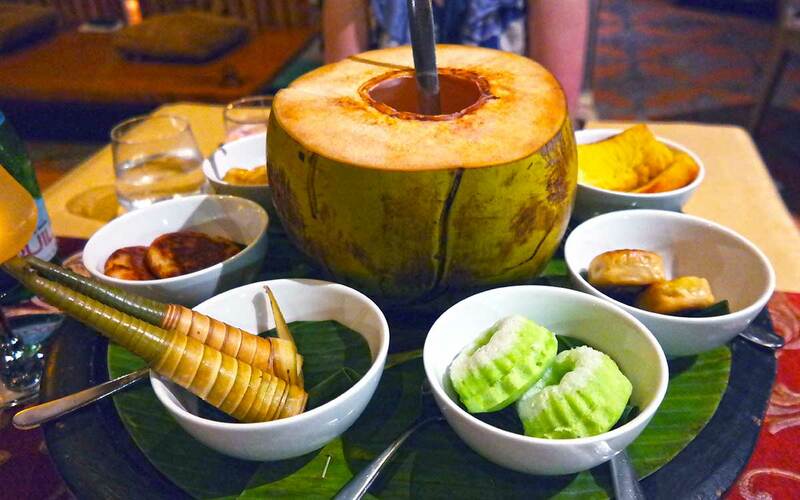 You know I am obsessed with food, so obviously I think you should go to Bali just to eat. You gotta eat the exotic fruits in every form and shape! Let’s start with an inexpensive, simple and easy tip: eat as much fresh fruits as you can and drink them too! Especially: drink watermelon juice, my favorite! Where ever you go, you can get fresh melon juice. Watermelon, cantaloupe, honeydew, sprite melon – any melon. When I think of some of my favorite moments in Bali, they have been relaxing with a glass of fresh melon juice in my hand. I started my morning with watermelon juice at W Retreat & Spa Bali Seminyak, it was easily available at the breakfast buffet — although it was a tough choice, because they also had every single other fruit juice and smoothie available! 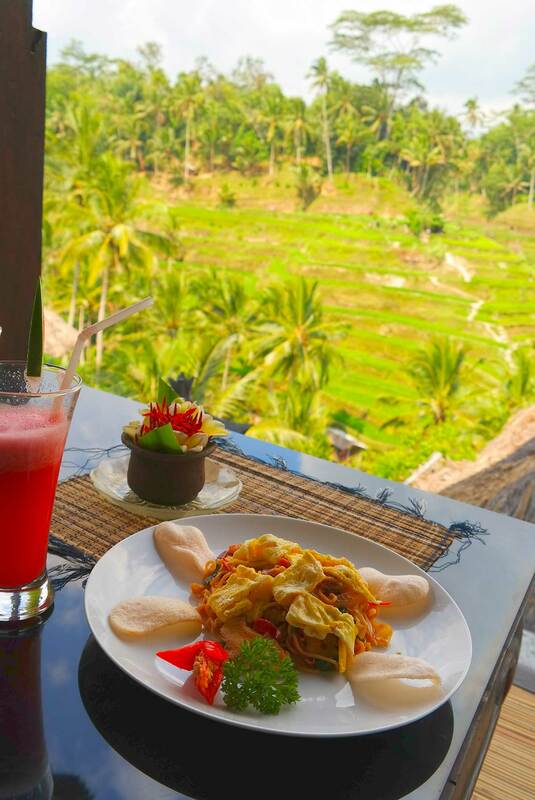 I also loved having lunch in Ubud over-looking the rice fields, and we couldn’t help but have melon juice as our drinks then too. When we stayed in a villa at St. Regis by the beach, we had our own dedicated beach chairs, and of course — room service to the beach area too. 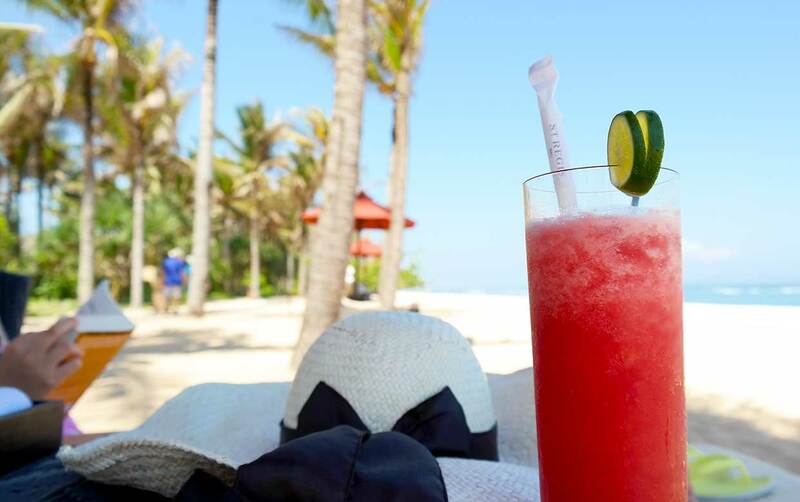 What’s a better drink to enjoy on the beach, than a fresh watermelon juice? Nothing, absolutely nothing. 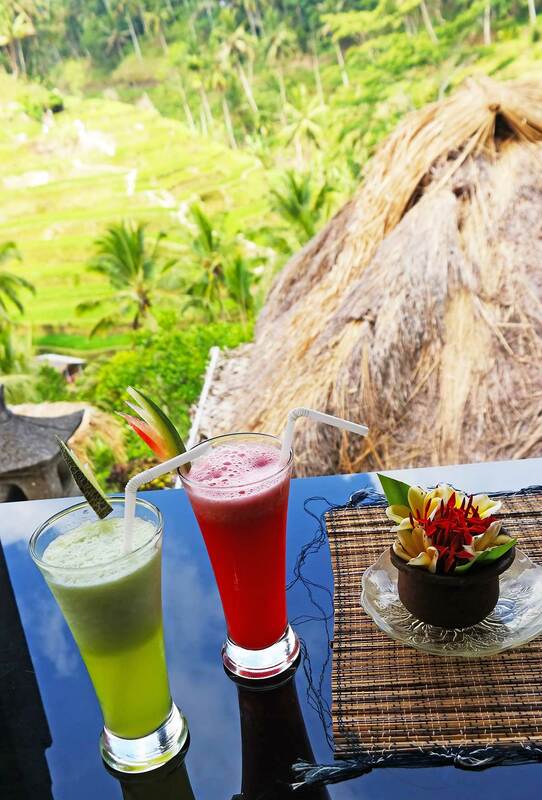 Melons are not the only fruits to savor in Bali. If you like eating healthy, and love fruit, Bali is a heaven for you. 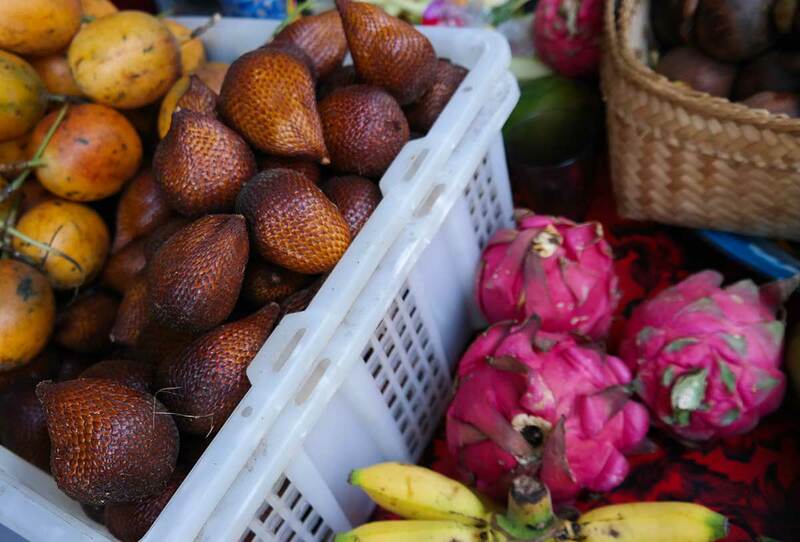 You will find mangos, passion fruits, papayas, bananas, and more exotic fruits like salak, also known as snake fruit, mangosteen, longan, durian, lychee and pitaya, also known as the dragon fruit. Some of them are not available all year round, but most of them are. You can find fresh fruits from local markets, and you can get them in various dishes. I highly recommend being adventurous and giving the exotic fruit a try when in Bali! While some of these you can get from grocery stores back home, they are not as fresh, and many are not even available. 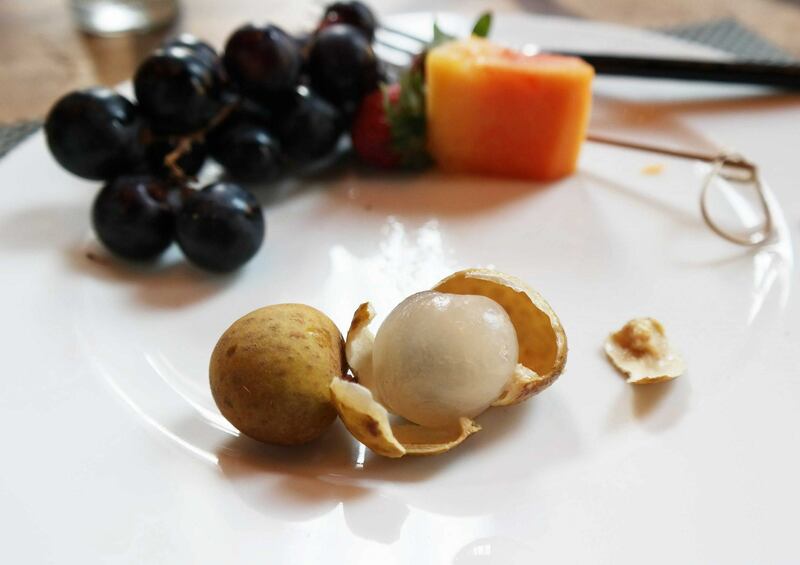 For breakfast… grapes, papaya and longan fruit at the St Regis. 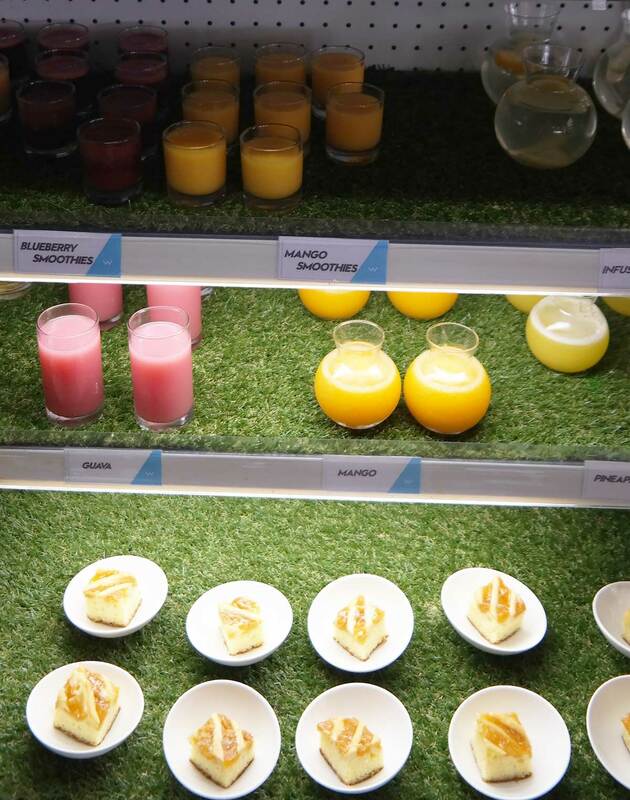 The W Retreat & Spa Bali Seminyak made the breakfast fruit even easier in these cute ready made fruit cups. 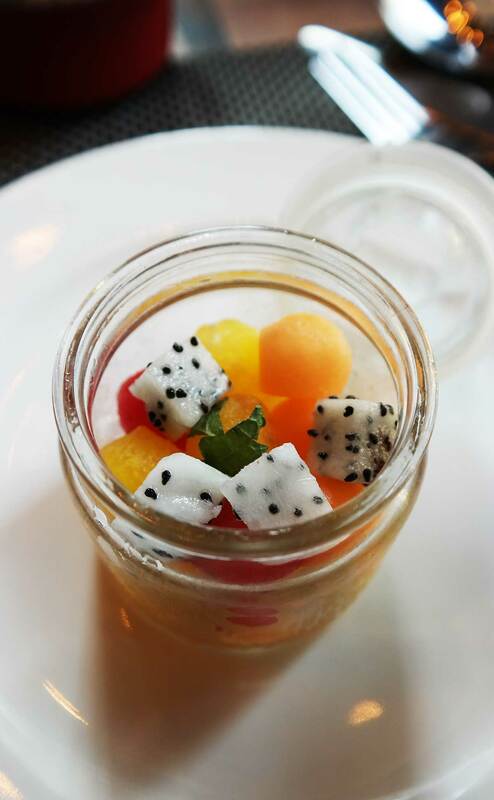 Mix of amazing fresh fruit, including mango, cantaloupe and dragon fruit. I personally am not an expert on Ubud, I have never stayed there, and only visited for shopping and a quick bite, pictured below. But Ubud’s rice fields are gorgeous, there is plenty of fun shopping, and some of the most popular yoga places are in Ubud. Absolutely a great place for a day trip, and for a lunch by the rice fields. I however, really recommend heading out to north east Bali, and making BALI ASLI restaurant a stop. It is located in Gelumpang village, near the town of Amlapura. Bali Asli promotes Balinese cuisine and culture without exploiting it or it’s people, and is run by Australian chef Penelope Williams, who fell in love with Bali, and after cooking in several restaurants around the world, decided to open her own in Bali. 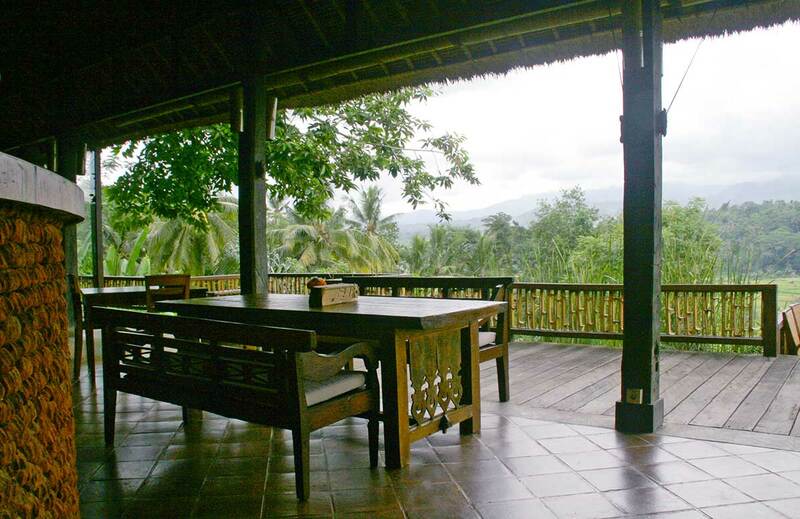 Bali Asli is fine dining with incredible views of the rice fields. The authentic Balinese food is incredible, and you are also in luck not just to get to eat it, but there are also cooking classes at Bali Asli, so you can bring some of your favorite Bali flavors home. 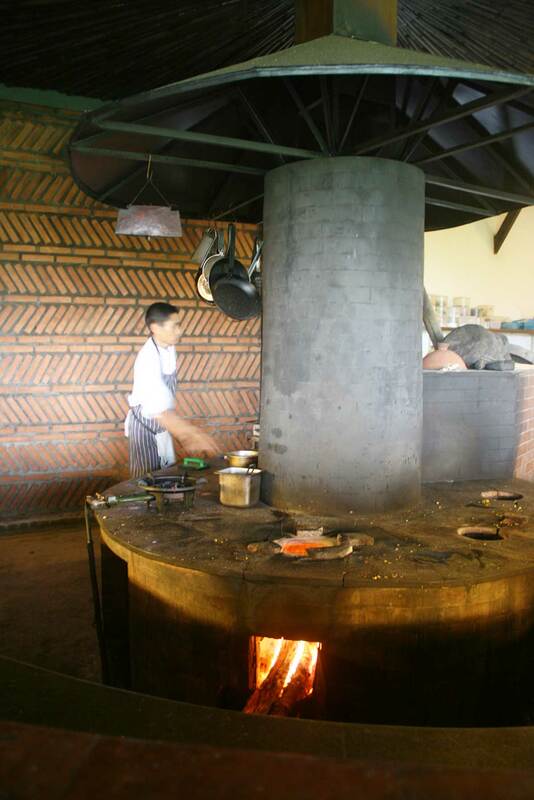 One of the differences in Balinese food is that it is mainly cooked on open fire. Yes, even in finer restaurants. Balinese people think food does not taste the same when it is cooked with electricity (or gas), and I have to admit I agree. You know even your summer BBQ at home tastes better than the same food cooked inside, right? I love how at Bali Asli restaurant the kitchen is right in the middle of the restaurant and you can see how your food is cooked to perfection. 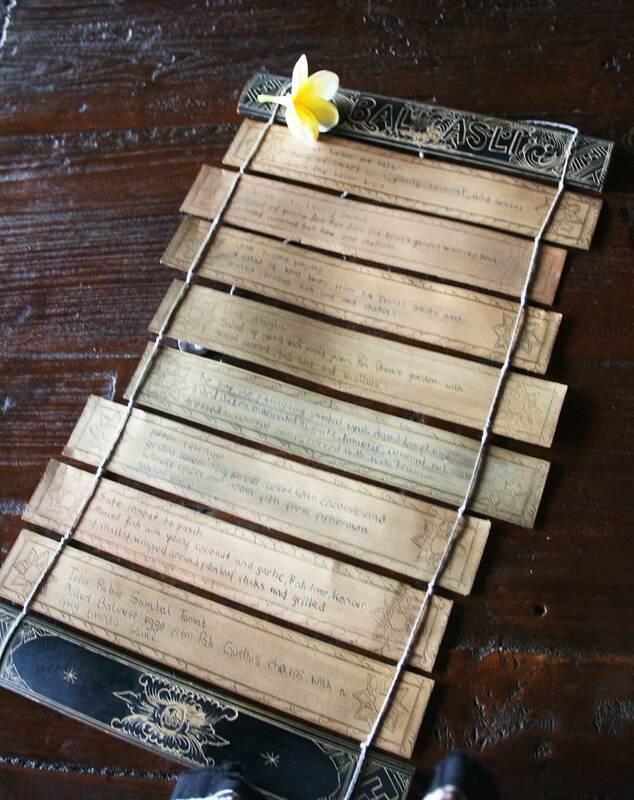 Even the menu is written on “aking lontar”, an original Balinese papurys, etched with coal unto bamboo strips. Everything to the smallest detail is truly is authentic Balinese at Bali Asli. 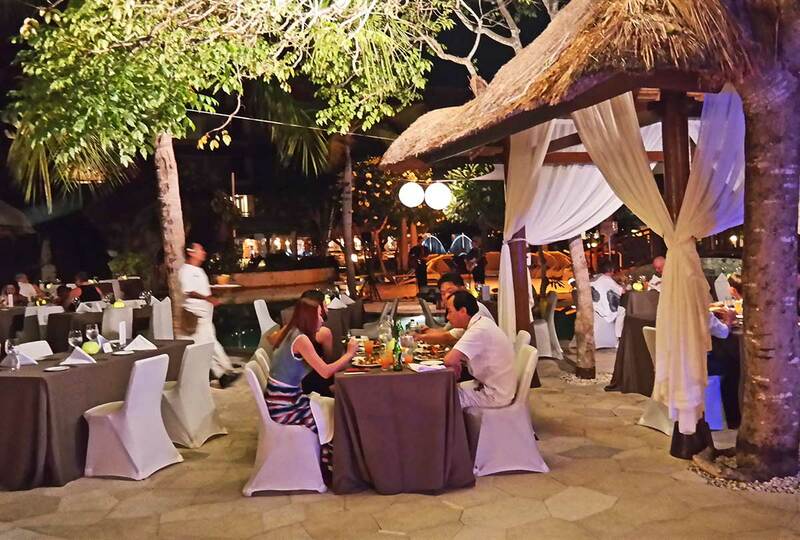 When the sun sets… Bali’s dinner time magic starts. 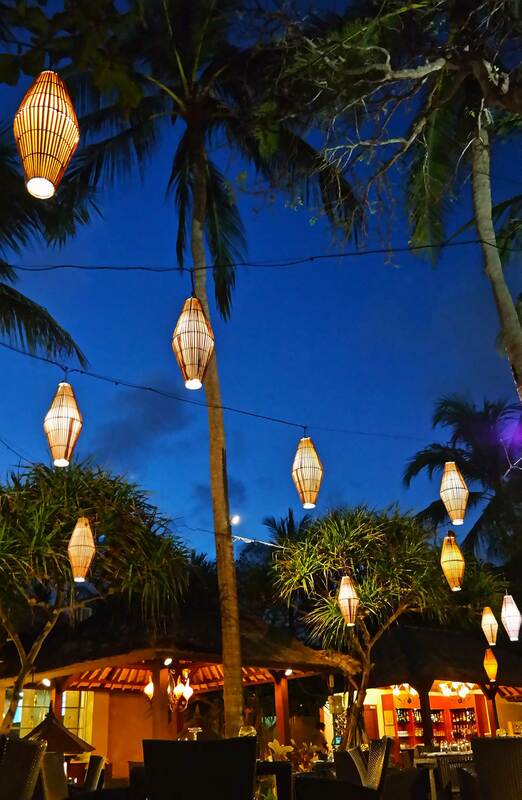 Time your dinner in a way that you can enjoy the magical Bali sunset. Either enjoy cocktails and watch the sunset before heading out for dinner, or make a dinner reservation in a beach-side place overlooking the ocean and watch the sun set as you eat early dinner. We? We preferred eating dinner under the stars, when it is more comfortable (less hot) for al fresco eating. Heading out to the traffic and to discover new restaurants was too much for us some nights. Traffic can be really bad in many touristy areas of Bali, like Seminyak, Ubud and Nusa Dua, so we opted staying close to the hotels for most dinners, or eating at the hotels — we of course, were pampered by staying in some of the most luxurious resorts on the island, and I have no regrets that we opted for “eating in” on several nights. 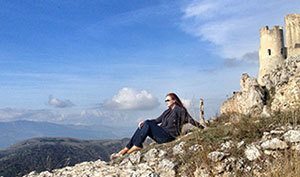 In fact, these hotel restaurants are worth the reservation, even if you are not staying in the property, and give you an excuse to see these properties. 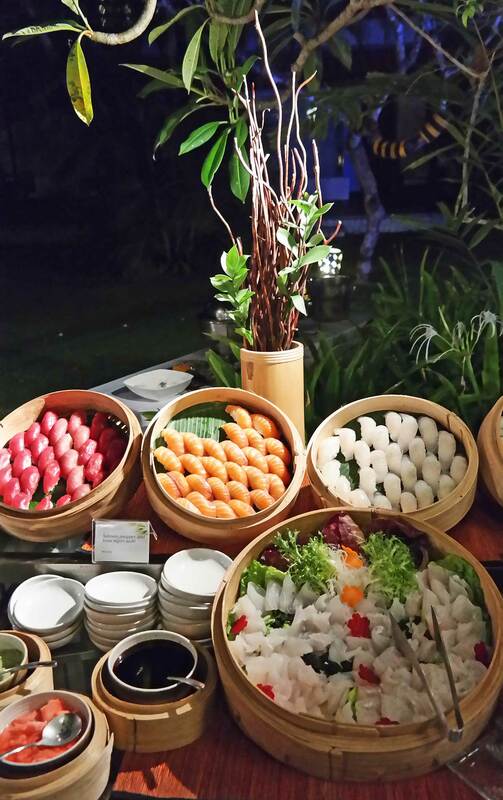 When we stayed at the Westin Nusa Dua, we enjoyed their special pool-side BBQ one night. The luxurious buffet happens once a week, and it was easy and the food was amazing. 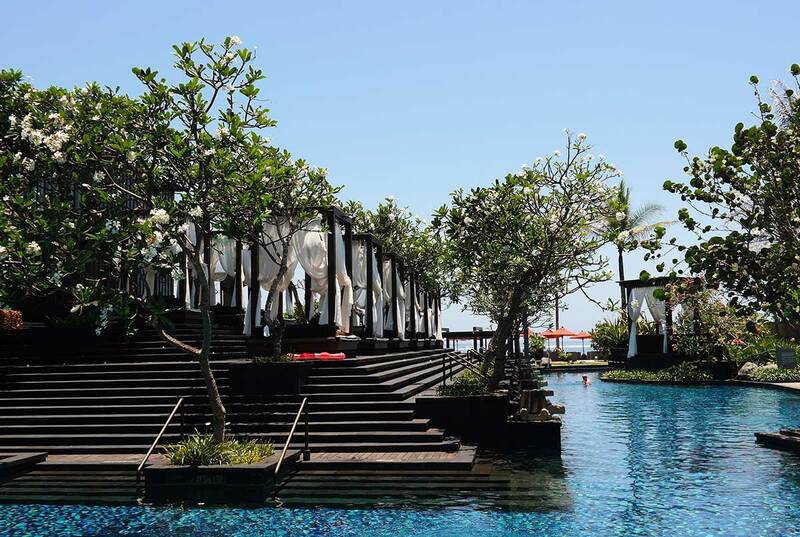 There are also several other amazing beach-side restaurants (and resorts) in Nusa Dua. We loved walking the beach boulevard and picking a restaurant with a table on the beach. When we stayed at the St. Regis, we ate “in” every night. 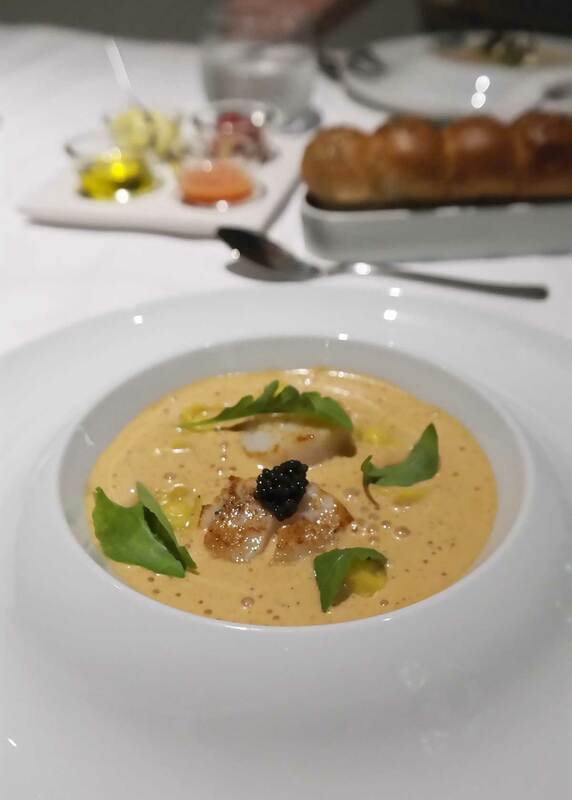 The dining experiences at St. Regis are phenomenal. 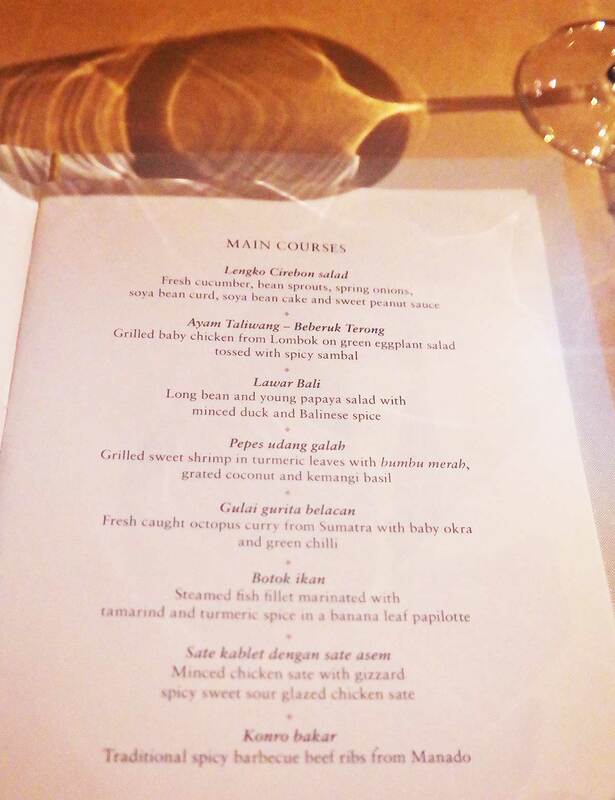 By far my favorite experience was eating at the Dulang, where you get a set menu, and it is authentic Indonesian cuisine in a very intimate and luxurious setting. You feel like a queen when you head to the small luxurious gazebo, and you just sit and wait all of the amazing food to appear on your table. If you are looking to buy a gazebo you can visit GoodGazebo.com, to find the best gazebo. I admit — some of the food was a bit spicy, but we learned a great trick from our waiter at Dulang: eat some honey after spicy food, and the burn in your tongue is immediately gone. We did order honey on a few other times on our trip after this too! And of course — there was dessert. Sweet, plentiful and exotic dessert. Sweet cakes, sticky rice and Es campur kelapa muda, iced young coconut juice with tender coconut meat in coconut shell. This is a popular dessert you can find in many other restaurants too, and it is way too sweet for me, but I recommend giving it a try! 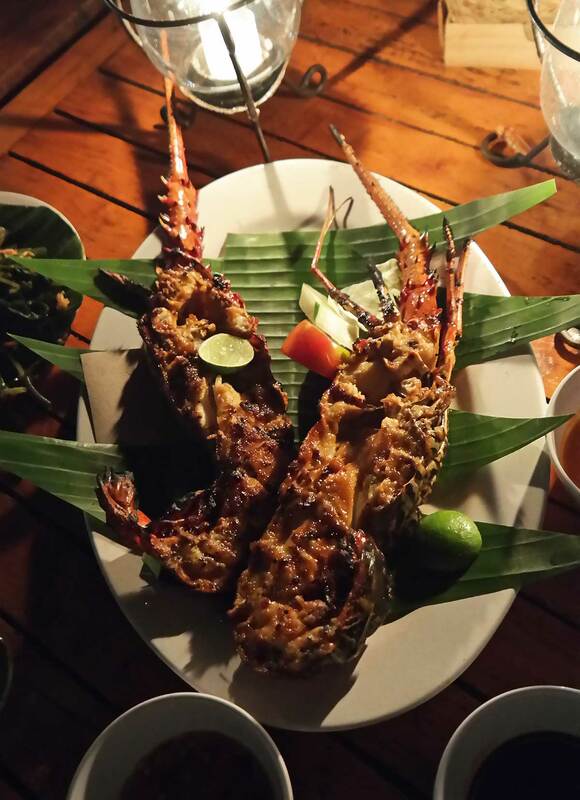 When you are looking for an exotic dinner experience, I highly recommend Dulang, however, if you want a romantic night by the ocean and Michelin star-quality food, the Kayputi restaurant at St. Regis might be more what you are looking for. The Kayputi menu is world class, and includes everything from Sturia caviar to Kiwami wagyu beef to duck to oxtail. 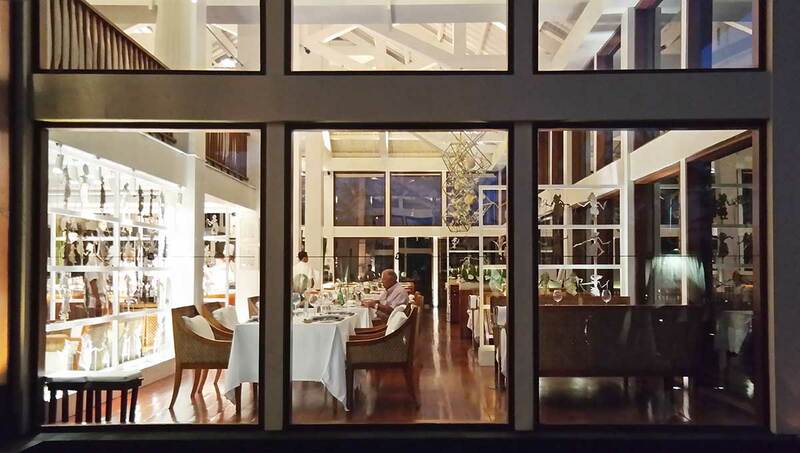 The food is fusion at its best, and it is THE fine dining experience of the island. 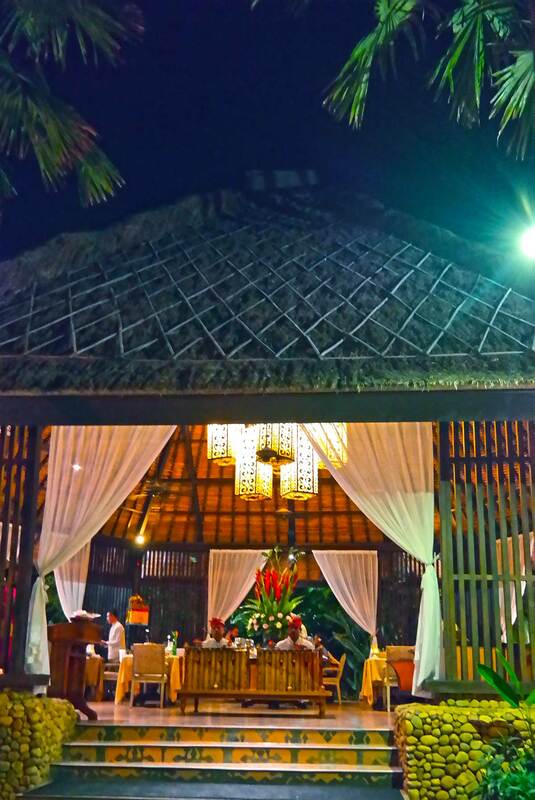 The food is truly phenomenal, but the atmosphere is why you also don’t want to miss Kayputi. The restaurant is a modern master piece inside, but I recommend outdoor seating. 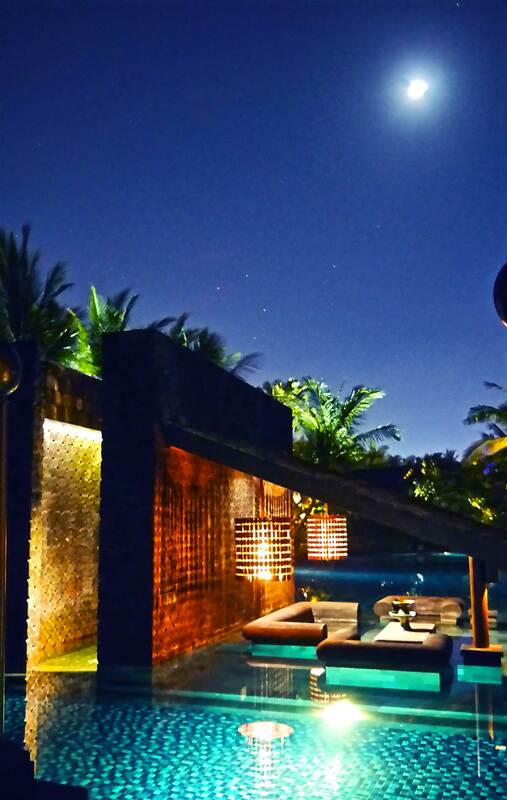 During daytime, take one of the lounges by the pool — at night time enjoy the starry nights and the ocean. You can’t go wrong. 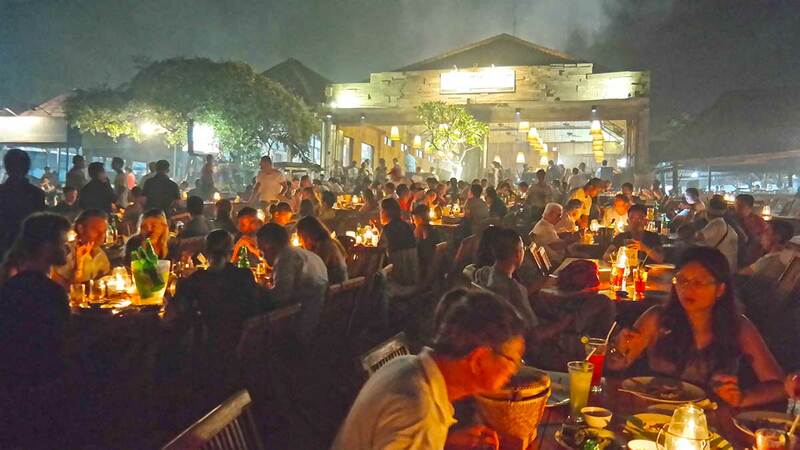 One of my favorite Bali-dining experiences is the Menega Cafe on Jimbaran beach. 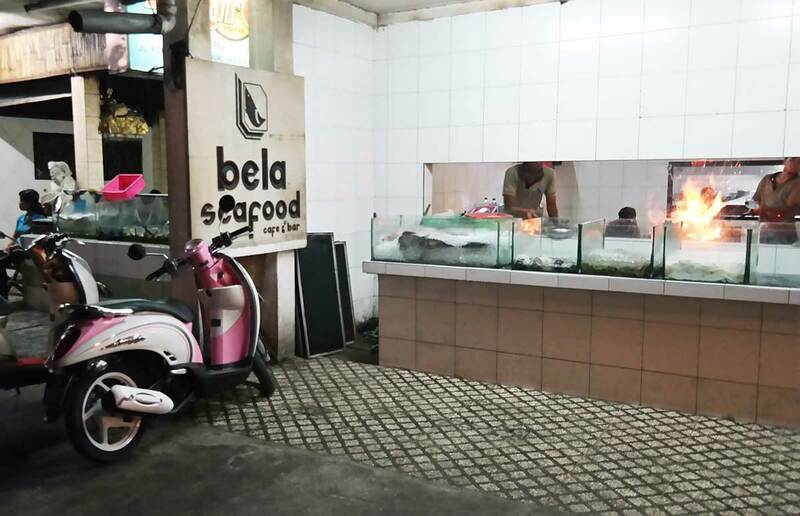 It is not the fanciest restaurant in Bali, and once you see it on the street, you will think you got the address wrong, because it honestly looks nothing like a fancy restaurant. 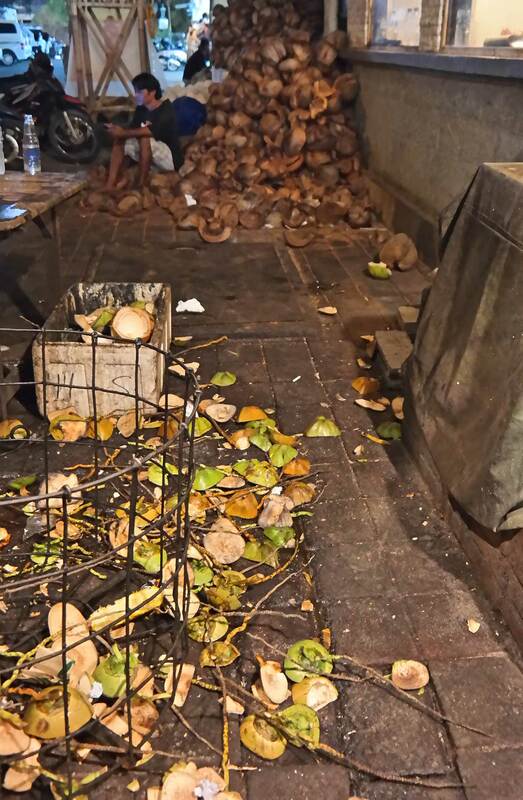 In fact, all you can see is the window directly to the kitchen, and you might even see a pile of coconuts on the street. Here: the drink is coconut water, directly from the coconut, and then the coconut shell is used for the BBQ grills to cook your dinner. But don’t worry — you are in the right place. Oooh, so right. The delicious smell of barbecue hits you before you even enter the restaurant (and yes, your clothes will smell like it by the end of the night). 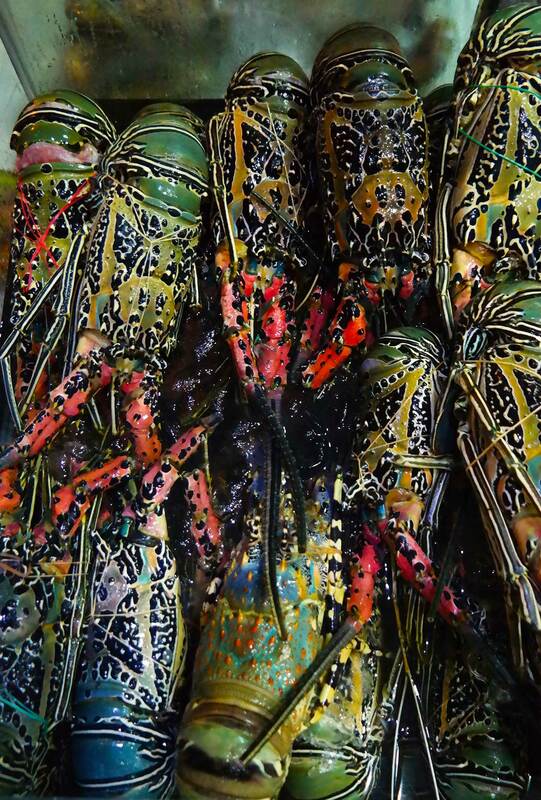 Upon entering, you will be led past the smoky kitchen, where chefs in t-shirts are grilling seafood on open fire and lobsters are climbing out of their containers, not knowing the fate that awaits them. 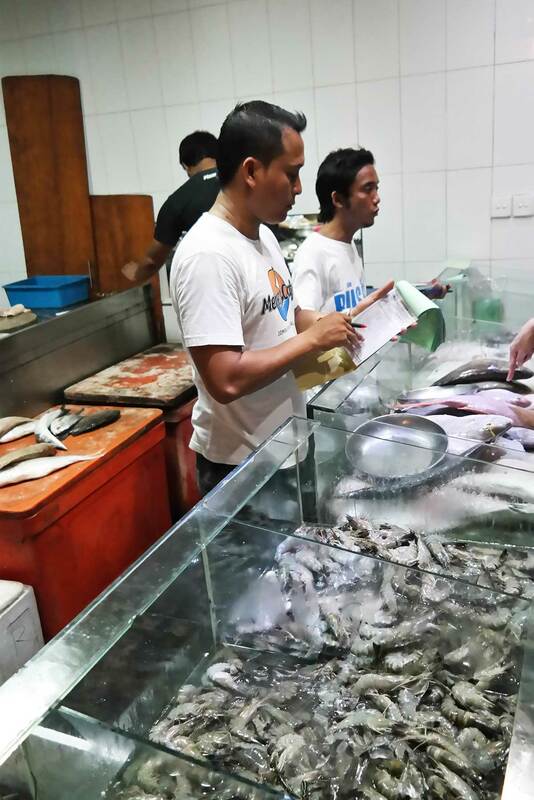 Once we got our table on the beach, our waiter actually asked us to go back to the fish counter on the front — and you will get to choose your own dinner. We chose the Menega special menu for two that came with one whole lobster, fish, 6 BBQ clams and 6 calamari skewers. Seriously, the BBQ seafood at the Menega Cafe is out of this world. I’ve never had this kind of barbeque seafood, and the taste mix is incredible — the flavor mix is something like Texas BBQ sauce mixed with Asian seafood. Smoky, sweet, but it has a little bit of a kick. The seating area is in the back, on the beach. When you get a table close to the water, sometimes the edge of the surf will gently hit your feet – don’t wear your favorite shoes, or take your shoes off if you sit close to the water. Truly phenomenal dining experience, and I highly recommend this entire experience; the food, the beach, even the smokey BBQ scent — just remember to make a table reservation, this place is very popular. There are several other restaurants on the Jimbabran beach, but this seems always to be packed.. for a reason. The customer service isn’t the fastest or the friendliest at Menega Cafe, regardless it’s worth it! The location is right across the street from Le Meridian Jimbaran, so if you are staying these, this is a great choice for you. 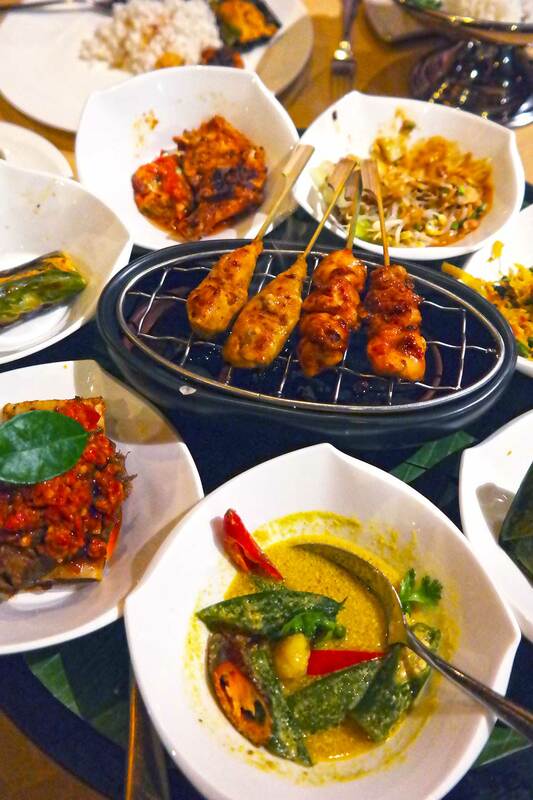 If you are a foodie, you can’t really go wrong in Bali. Wow. Just wow. Bali is definitely on my list of travel! I’ve heard amazing things about it and your photos are enticing me even more! This looks dreamy!!!! Bali is on my bucket list for sure! 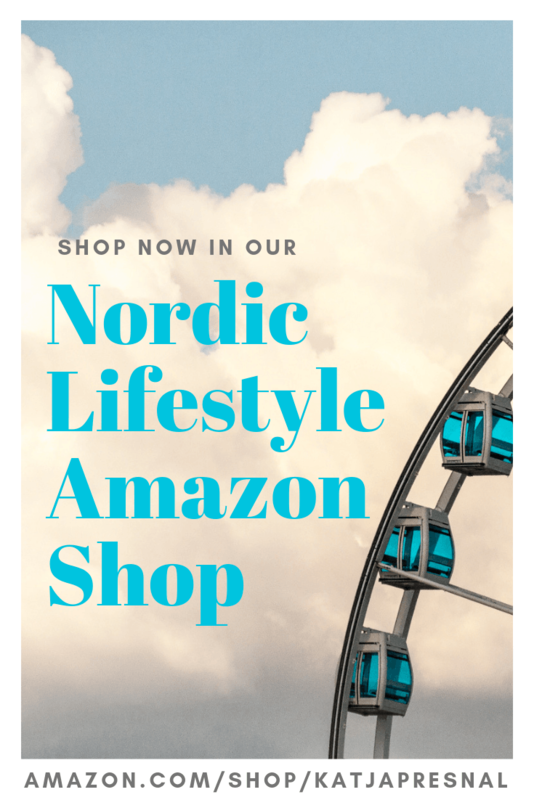 What incredible photos and places to see in this part of the world! You photos are gorgeous! It makes me wan to go there NOW!!! Seriously, looks so amazing! There truly are not words enough to say/share/ramble :-) how Bali is my dream destination. You simply have to go, I know you would love it! !